In America, 1 out of 5 adults is living with a mental illness. Despite the prevalence of depression and anxiety disorders, the “stigma” of mental illness can prevent people from reaching out and getting the help they need, even from their own families. 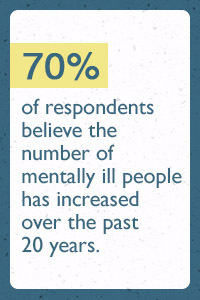 In fact, approximately 60 percent of adults with a mental illness don’t receive any mental health services. 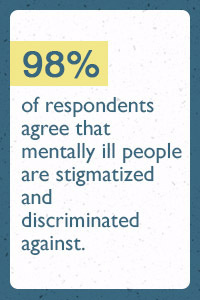 So, what contributes to the stigma surrounding mental illness? The list is long, but one of the biggest factors is misinformation about mental health conditions and those who suffer from them. A survey published in 2015 found that only 7% of respondents from developed countries believed that mental illness could be overcome. With these kinds of misconceptions, it’s easy to see why stigma surrounding mental health is rampant. We wanted to find out which U.S. regions and demographics have the best understanding of the reality of mental illness, so we surveyed over 2,000 people to find out where they rank themselves when it comes to accurate information on the topic. Take a look at our results below. When we asked survey participants to rate how informed they were about mental illness on a scale of 1 (least informed) to 5 (most informed), the average response was 3.5, meaning that the average person considers himself or herself only slightly informed about mental illness. Mississippi came in at the high end of the spectrum with an average of 4.2,, considering itself the most knowledgeable state on the subject of mental illness; however, when it comes to access to mental health care considered alongside the prevalence of mental illness, Mississippi ranks 43rd in the nation: the state spent just $56 per capita per year on mental health services. 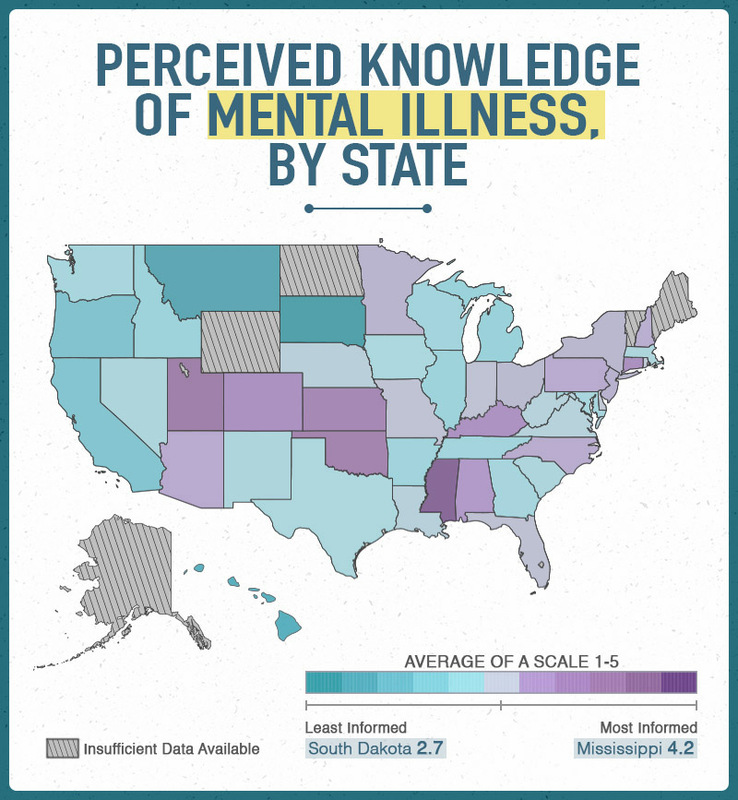 On the flipside, South Dakota, which ranked itself the least knowledgeable state, is actually in the top 10 when it comes to treatment for mental health. And while it’s possible that Mississippians really are the most informed, another explanation may be the Dunning-Kruger effect, which demonstrates that those who are the worst at something are also the worst at estimating their own ability (i.e., they think they’re much better than they are). 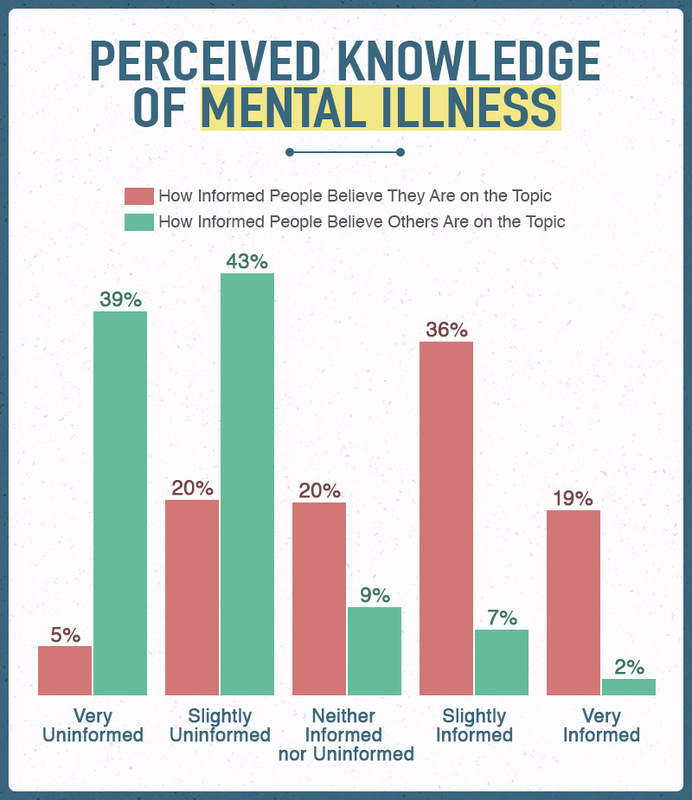 When asked about their own knowledge of mental illness, 55 percent of respondents believe themselves to be at least slightly informed on the topic. 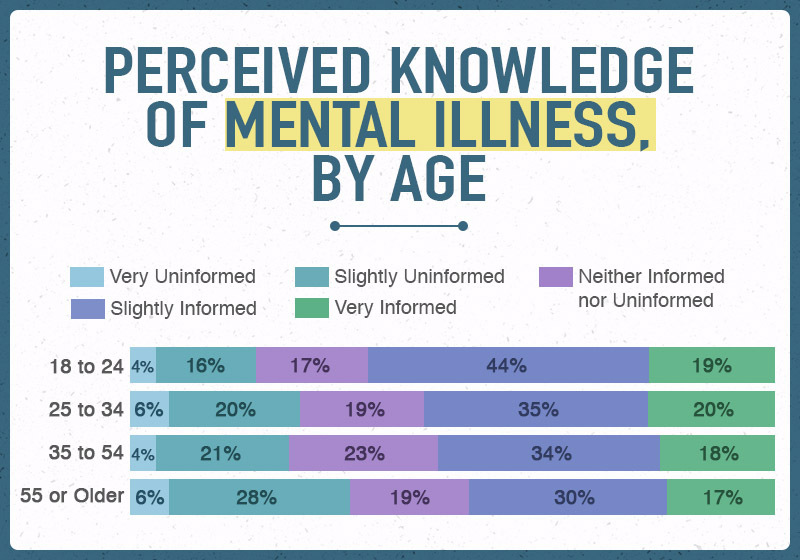 When asked about other people’s knowledge, however, only 9 percent of those surveyed feel that their neighbors are informed about mental illness. 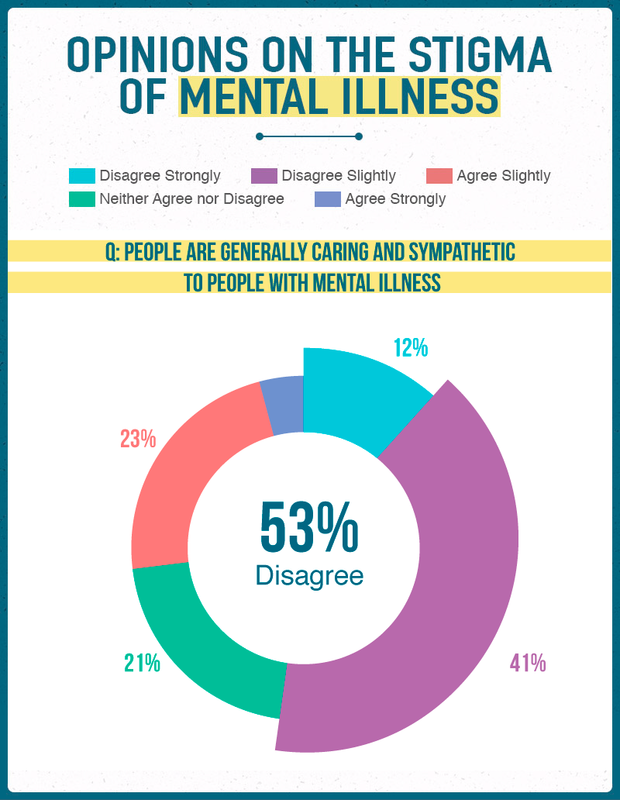 This leaves a staggering 46 percent gap in perception and implies that people simply aren’t talking about mental illness enough to really rate themselves, or others, accurately. And if that discrepancy in perception seems large to you, consider that a study published by the CDC found something similar: While 57 percent of adults believed that people were caring and sympathetic to persons with mental illness, only 25 percent of adults suffering from mental illness felt that people were caring and sympathetic to them. The takeaway? Whether you can point to the Dunning-Kruger effect or not, it’s clear that people tend to overestimate their abilities and knowledge when it comes to the reality of mental health in this country. Breaking the data down by age, older generations tend to rate themselves as less informed than younger ones. Sixty-three percent of 18 to 24-year-olds believe themselves to be at least slightly informed on mental illness, and just 48 percent of those 55 and older feel the same way. While there could be many explanations for this, one may be the shift in the way successive generations have viewed mental illness. In the 1950s, people tended to consider only very obvious conditions like psychosis as a mental illness; illnesses like depression weren’t distinguished from just ordinary unhappiness. But over time, as America made progress in the fields of pharmaceuticals and medical technology (e.g. brain scans, mobile and web platforms, etc. ), the subtlety and distinction of mental illness was able to be more fully recognized. These advancements may have come with a greater knowledge and decreased stigma. 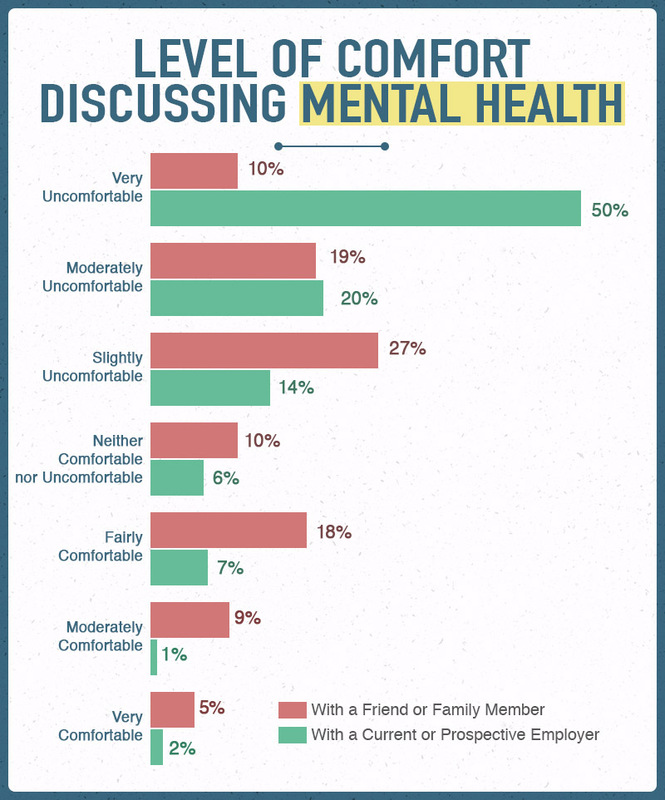 When asked to consider their comfort level in discussing their own mental health with friends, family, and employers, respondents reported being mostly uncomfortable. Fifty-six percent say they’d be uncomfortable talking to friends and family about it, and 84 percent say they’d be uncomfortable talking to their employer. Although we would all hope that those closest to us would be kind about our condition, the fact that 26 percent of adults living in homeless shelters have a history of mental illness seems to indicate that not everyone has the support they need. When it comes to employment, those struggling with mental illness should be aware that they have rights: The Americans with Disabilities Act prohibits employers from discriminating on the basis of mental illness provided that the employee is able to perform essential functions. It also entitles them to “reasonable accommodations” to aid them in their work. Does Age Influence Mental Health Discussions? Despite being the same group that rated themselves least knowledgeable on the subject of mental illness, individuals 55 and older are most likely to talk to friends and family about their own health. 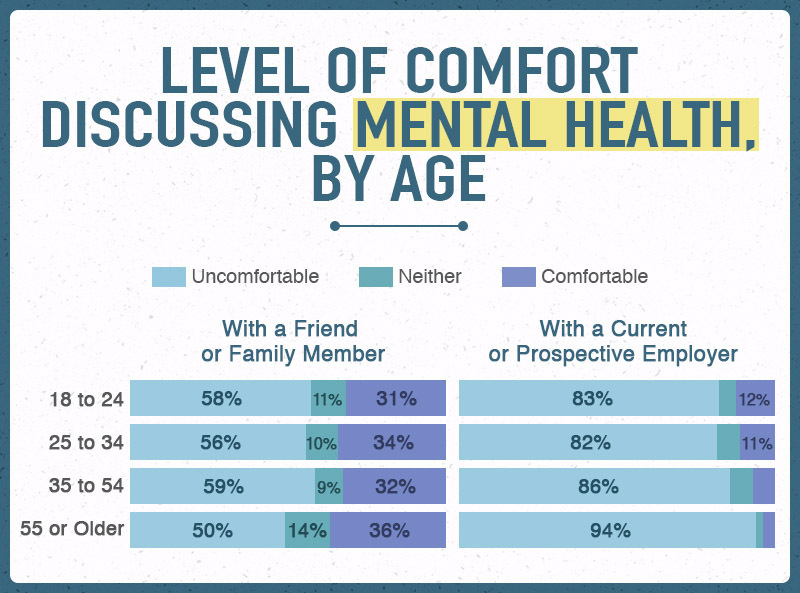 On the other hand, respondents ages 18 to 24 are the least likely to feel comfortable discussing their mental health with loved ones, despite the fact that the average onset age for many disorders falls in that range. But the younger crowd was also the most likely to discuss their mental health with an employer, perhaps demonstrating the fact that millennials, unlike some earlier generations, tend to value their personal well-being more than their careers and strive for more mutual respect in the workplace. 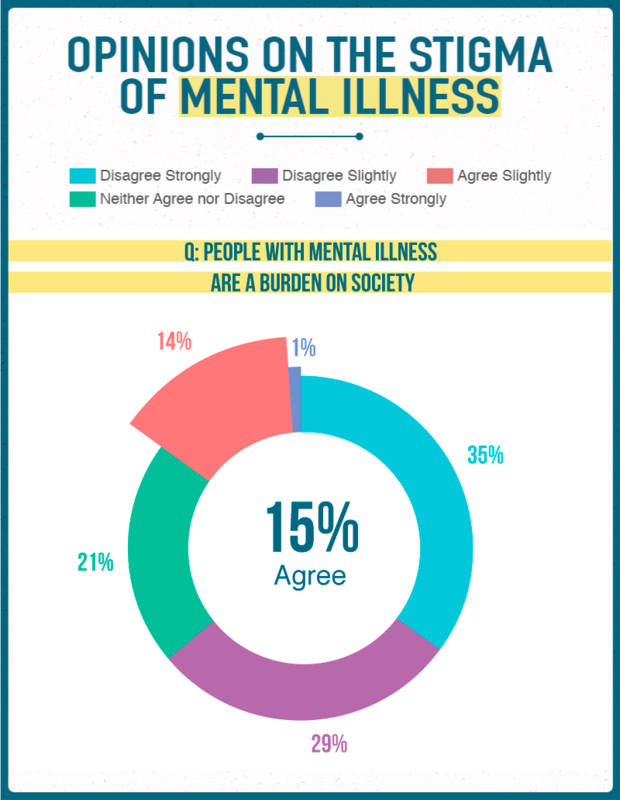 Detailed survey questions on the stigmas surrounding mental illness demonstrate that we still have a long way to go as a society. 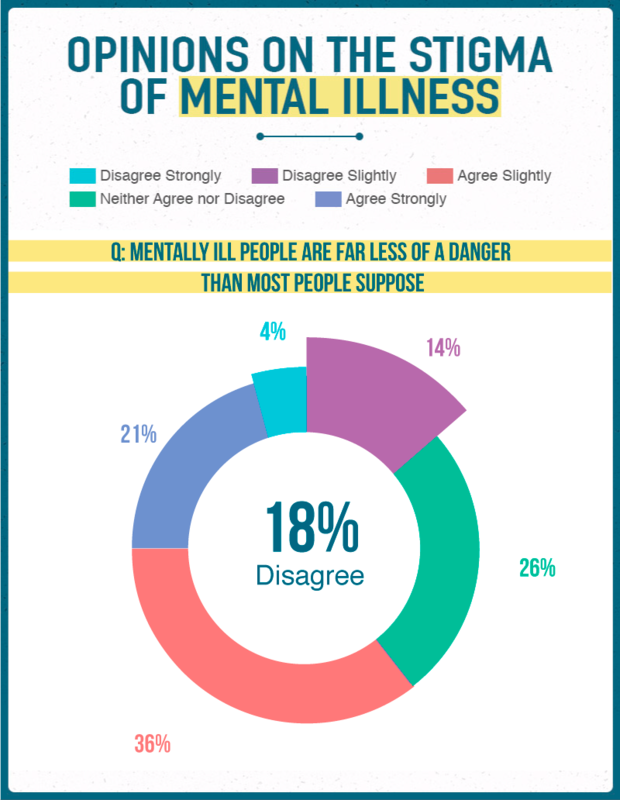 Fifteen percent of respondents label people with mental illness as “a burden to society,” and 18 percent disagreed with the statement that people with mental illness are less dangerous than generally supposed. Other studies throughout the years have also shown a connection between mental illness and our perception of danger and violence. A longitudinal study showed that the percentage of Americans who described mental illness in conjunction with violent behavior nearly doubled over the span of the 46-year-long study. And a 1999 report showed that 60 percent of characters on TV who were depicted as having a mental illness were also depicted as being involved in crime or violence. In actuality, individuals struggling with mental illness are more likely to be the victims of crime than the perpetrators, and the link between mental health and violence is small. 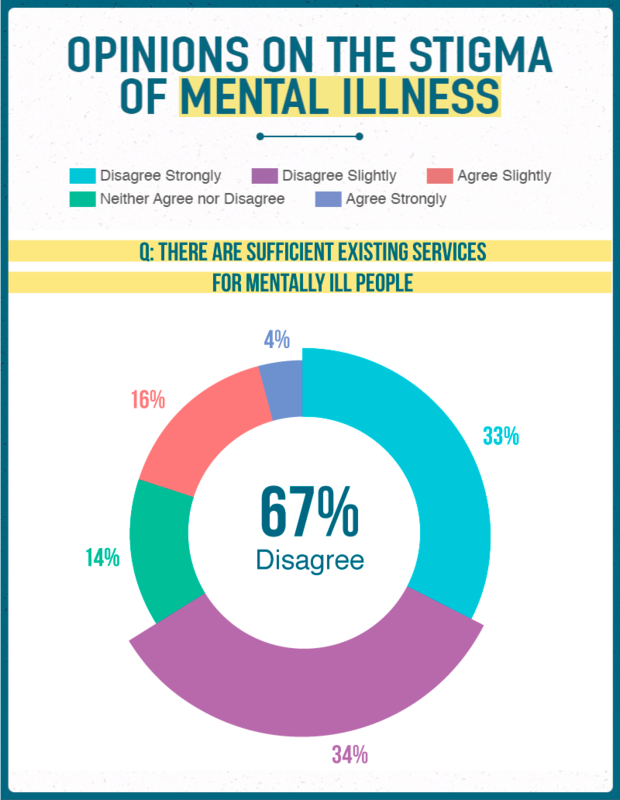 Another strong statistic: 67 percent of people polled believe there are insufficient existing services for people with mental illness. And they’re likely right. According to a National Alliance on Mental Illness (NAMI) study, only about 40 percent of adults and 50 percent of children with mental illness actually received treatment; another source indicates that African-Americans and Hispanic Americans used mental health services about half as often as Caucasians. Despite nearly two-thirds of respondents saying they think mental health services are insufficient, only 30 out of 51 states (including Washington D.C.) increased spending on mental health services for the 2015 fiscal year. Other states, such as Rhode Island, cut their mental health budgets by as much as $33 million. 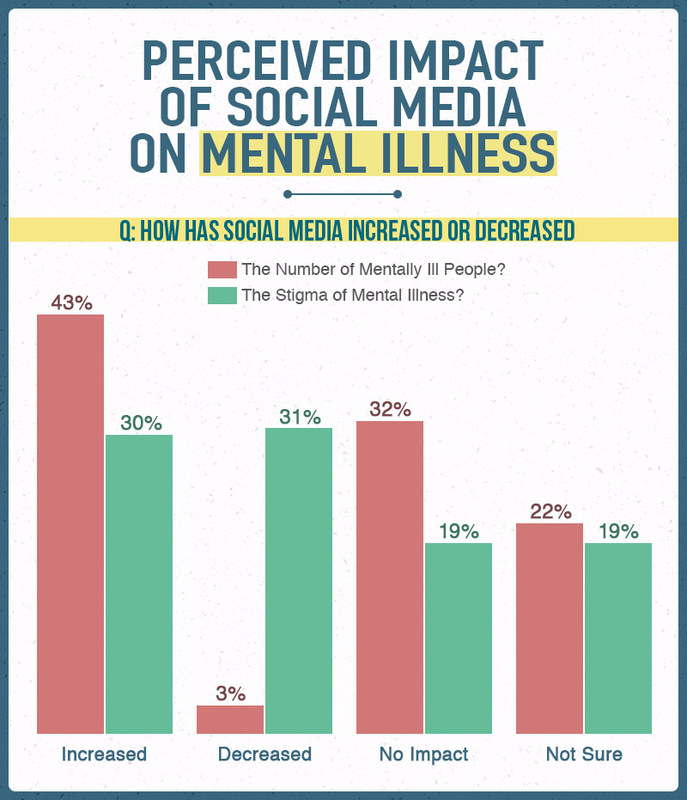 Has Social Media Increased or Decreased Mental Illness Stigma? Lastly, we asked respondents about everyone’s favorite topic – social media – and the results are mixed. 43 percent of those surveyed feel that social media has increased the incidence of mental illness (only 3 percent believe it has helped to decrease the problem). There may be evidence to suggest that they’re right, including studies that show a connection between internet and social media usage and suicidal behavior. Other reports posit that adolescents can suffer from something called “Facebook depression,” which is standard depression that is triggered when teens spend an excessive amount of time on social media. When it comes to stigma, however, the jury is still very much out: roughly equal numbers of respondents believe that the use of social media increased and decreased the level of stigma associated with mental illness. And both could be right — social media can be a very powerful tool in spreading awareness and in helping people feel that they’re not alone, but it can also be abused and used for cyberbullying and the spreading of misinformation or stereotypes. While the stigma surrounding mental illness is alive and well in America, it shouldn’t stop you or a loved one from getting the help you need. You can take control of your mental health and become a part of the solution by visiting MentalHelp.net or calling 1-888-993-3112Who Answers? today and taking the first steps toward treating your condition and changing the rest of your life. 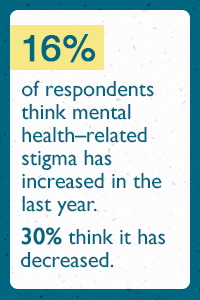 We surveyed 2,053 respondents from the United States on questions relating to mental health and the stigma that surrounds it. 1,193 respondents identified as male, with 860 respondents identifying as female. States represented by fewer than five respondents were omitted from map results.